So that afternoon we were treated to a fun and exciting interactive product presentation where we got to see the features and power of the new JBL Link and Everest Series speakers!!! Believe me, you would WANT to have one (or two or three or four) in your own home. HARMAN International, a wholly-owned subsidiary of Samsung Electronics Co., Ltd. has unveiled the JBL LINK series, the first voice-activated speakers to bring together JBL’s Signature Sound with the Google Assistant. 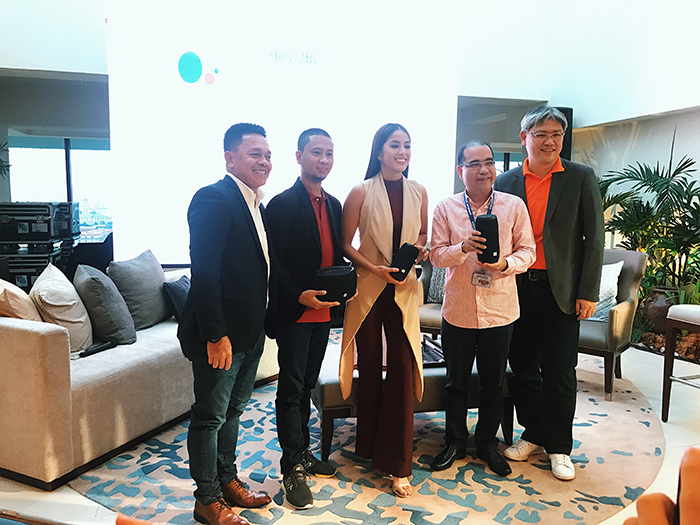 With this, JBL is the first brand to officially launch Google Assistant-powered speakers in the Philippines!!! Available in four models, the LINK 10, LINK 20, LINK 300 and LINK 500, give consumers rich, full-range sound and instant access to their favorite music (and other amazing features) through voice control. Now is the time to use the famous expression, "Look Ma, no hands!". Get it? Hehe. Tech Editor - Art Samaniego, Yugatech Managing Editor- Louie Diangson, JBL Philippines Brand Ambassador - Gretchen Ho and Brand Activation Director and Sales Director for Car Audio of Harman International APAC - Seng Hock Chang. Sir Art Samaniego tried out the the new JBL Link speaker himself inside the suite-- and he too was blown away! So high-tech! JBL Link Series specs and pricelist! Speakers were given away and Paul won the raffle!!! So lucky waaah! 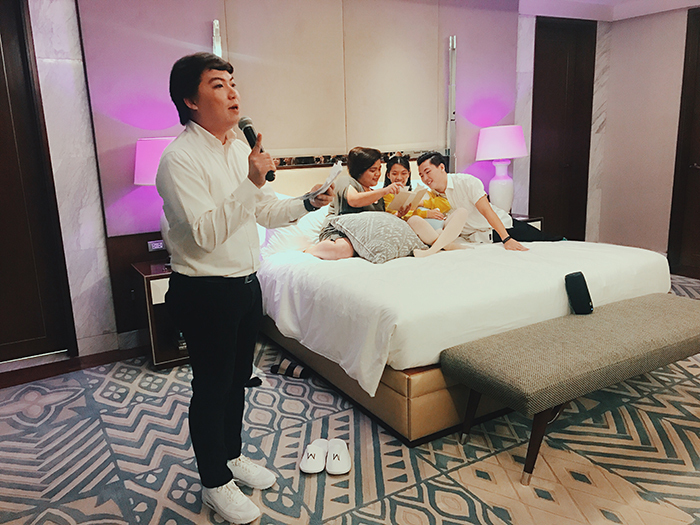 The product demo was hosted by super funny Chino Liu and conducted at different areas inside the Presidential Suite. Demo of the Link 10 inside the bedroom! There were actors who demonstrated and showed us how to dim the lights, turn on the speaker to play different tunes and lower the speaker volume just by saying it out loud! Voice command examples: "Hey Google, play Thinking Out Loud by Ed Sheeran" or "Hello Google, lower down volume to 50". So cool! In the bathroom, we were shown how to use voice command to call someone or send someone a message without even touching your phone. Just dictate your message and Google will do it for you! I didn't get to take a photo (I was too busy watching and being in awe haha) but there was also a product demo in the living room where they showed us how you could play songs or videos on your speakers AND your television through voice command. It was also shown how you could link speakers inside the house for the best sound experience! The LINK speakers feature high-definition music streaming with Chromecast built-in, providing an elevated music experience, best-in class sound quality and endless entertainment from the most popular music and entertainment apps. Last stop was the kitchen! I was so amazed when they showed how through voice command they were able to turn on a blender!! How? So cool is that! Powered by Google Assistant, these speakers can be connected to your smart appliances through the Google Home app. Plus, do you know that these speakers are waterproof? You need not worry about spills or toppling it over in the sink or tub! Gretchen mentioned that you could even submerge it in water. Perfect for clumsy people like me. Haha! Me wearing the Everest 710GA headphone while holding the Link 10 speaker! 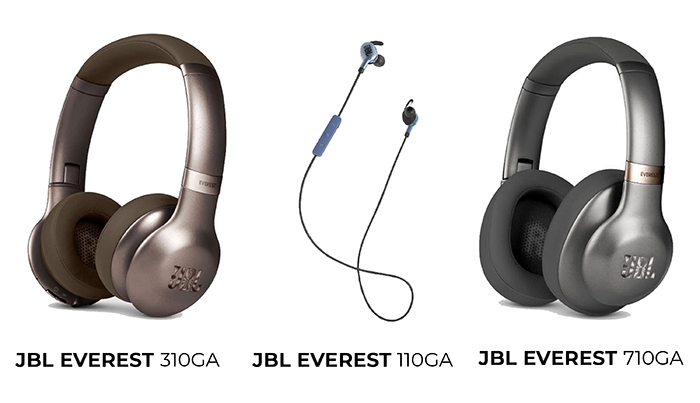 Through Google Assistant, all three of the in-ear Everest Elite 110GA, on-ear Everest 310GA, and over-ear 710GA allow users to have easy and convenient control over the connected device’s notifications, music, phone calls, SMS text messages and other smartphone functions. The revamped Everest lineup also come with a touch-sensitive ear cup and earbud, allowing one tap access for Google Assistant. Carrying the signature JBL sound, the Everest Elite 110GA, Everest 310GA, and Everest 710GA promote long hours of playtime with a stamina of 8 hours, 10 hours, and 25 hours respectively. Designed for you to enjoy uninterrupted music anywhere you go, the LINK 10 and LINK 20 speakers are made highly portable with IPX7 waterproof rating and comes with 5 and 10 hours of playing time respectively. The LINK series’ larger members, the LINK 300 and LINK 500, meanwhile, are both made to be a reliable music source at home. 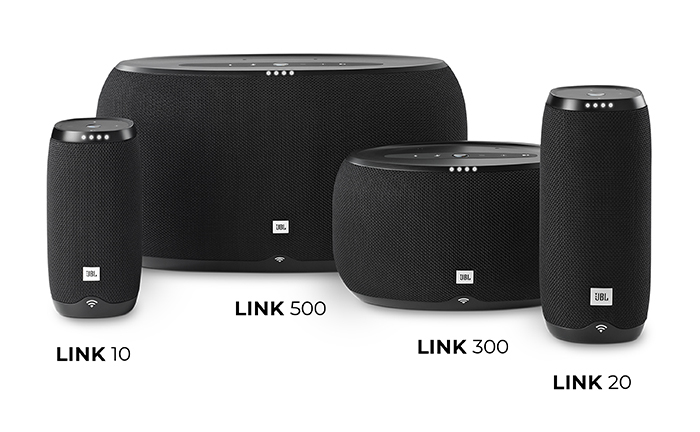 Also The LINK 300 and LINK 500, along with other JBL speakers can all be connected through any home Wi-Fi network for a multiple speakers setup for a powerful, louder multi-room listening experience. Love it!